Philips Hue Bridge v2 owners might be interested in this. I saw @wehooper4 work on "jailbreaking" Philips Hue Bridge v2 and decided to continue, based on what was already discovered. After several hours I was finally able to break inside. 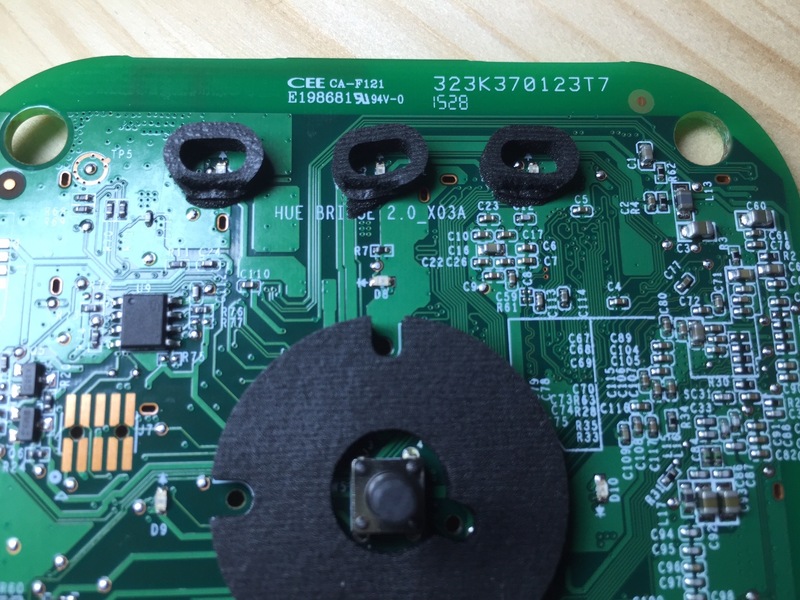 TL;DR: you will need solder skills and UART access to the device. First of all, we need to get access to the U-Boot command line, to be able to load custom firmware. Because of the boot delay environment variable set to 0 seconds, U-Boot in Hue Bridge v2 doesn't allow to interrupt booting process at all, so the idea was to break it somehow. The easiest way for that is to temporary disconnect SPI NAND FLASH as it's the one U-Boot is loading kernel from. Qualcomm Atheros SPI NAND Driver, Version 0.1 (c) 2014  Qualcomm Atheros Inc.
Power down device and solder back jumper resistor to make NAND works again. As it turned out, rootfs filesystem is SquashFS inside UBI container (thanks to my colleague @obsy for help with extracting the firmware). Just for reference: extracted root-0 filesystem, from some older version of Hue firmware. 3. How to get root password/access?! abort "Init in progress: Please try again later..."
Just a small update with shorter instruction and photo of the PCB. 2. Connect over UART (115200 8n1) and power up device. 4. Power down device and solder back R31 (or make there jumper with solder or a wire). Good post. I would be getting my Philips hue v2 bridge soon. I am a novice to OpenWrt. I would like to update it to CC version. After rooting will I be able to upgrade the firmware(using Luci or sysupgrade) without any other modifications. If I can upgrade which binary should be used. Because I don't see Philips hue profile in the supported hardware. This device isn't supported at this moment. I need to install python on Philips hue. 1. Install python using opkg on the existing openwrt. 2. Work on creating custom image from scratch. I doubt whether first option will work. Because my colleague failed to connect to internet from philips root. Now second option also looks like a huge work as there is no support for Philips hardware. I was hoping to load OpenWRT to the Philips Hue to replace what's on the bridge currently. I'm kind of new to OpenWRT, so could I ask how you flashed the firmware and what exact build you used? I was using this tree: https://github.com/domino-team/openwrt-cc (GL-AR300M has SPI NAND).